In Tala, Caloocan City, where there are vast deposits of clay, the Tala Foundation Inc. has established the Cardinal Ceramics Plant. 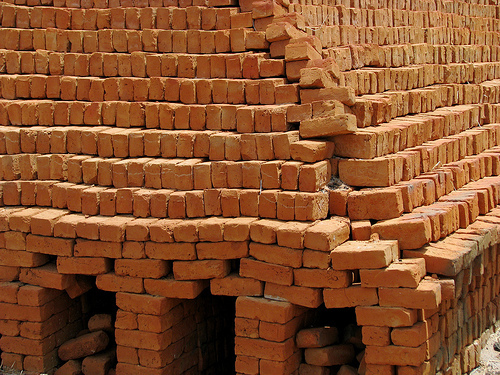 The brick-making plant is a socio-economic project of the Foundation aimed at providing employment and additional income while at the same time utilizing the mineral deposits in the vicinity. 1. Mine the raw clay with the use of spades, hoes and picks. 2. Remove stones and other impurities using a 14 mesh screen. 3. Add water and sand in the proportion of 25% water and 10% sand, by weight. 4. Place the mold on the drying platform Put the clay mixture in the mold and manually wedge the clay. Scrape off the excess clay. 5. Remove the mold and allow the newly made brick (or green brick) to dry at room temperature for 3 to 4 weeks. Turn “green bricks” at regular intervals to prevent warping and cracking. 6. Pre-heat the gas kiln for 2 hours, setting it at 980 C. Stack the bricks in “tie-tricks” formation. Fire for 16 hours. 7. Let the bricks cool completely before using. If you don't mind, may I know where is the exact address where I can find the Cardinal Ceramics Plant/Brick-making plant? We, 5th year BS Civil Engineering student from Rizal Technological University, are interested to visit and conduct some experiments for our thesis. You will be highly acknowledged for the information.Thank you and I hope to hear from you.